​"It's lovely in here, bright & clean" Satheesh M.
​"Very satisfied with the treatment" Elliot C.
​"Dr. Bains is very good, would definitely recommend him" Tomeka W.
​"Dr. Lopez was fantastic, he helped to ease my concerns about being a 34 year old with braces!" Nina B. ​"Everyone is welcoming, caring & professional" Shaunda G.
​"No toothache after treatment" Ida J. ​"HealthCare Elite makes you feel very comfortable, especially if you are nervous" Kaylee D.
​"Friendly & Local" Sofia P.
I would like to express my gratitude to you all the receptionist, the nurses and especially Dr Diana Photay, for the high treatment I received. I have attended other surgeries in my time, and found it very hard due to being very nervous, and at one time I could not go at all, as nerves got the better of me. I have at last now found a Dentist Surgery I would not hesitate to return to knowing I would be very much looked after, with such friendly professional treatment. Brilliant – worth every penny! Diane has been my dentist for over 20 years and she explained the process thoroughly. Constant check up to see how the treatment was going – she was also well pleased with the results. Advised using your treatment as a top-up every month which I will be doing. Everyone was friendly and the staff were really helpful, it was actually pretty fun! I was really pleased with the treatment, I had a white mark on one tooth that made the others look really brown but now they all match. Also, I can reuse the trays if my teeth ever need topping up. The staff were very polite and saw me straight away, they explained everything to me so I was perfectly comfortable the whole time. The dentist and nurses were lovely, definitely recommend them! I was worried because my bottom teeth looked a lot darker than the top ones but using the Saber kit has made them match so I'm well happy. I'm normally a bit scared at the dentist but the receptionist was really nice and made me a cup of tea. Definitely good for nervous patients. The Patient was very concerned about the appearance of their front teeth. The patient had lost their upper right central incisor and the teeth had drifted. Spot grinding of upper right central to look like upper left central. Upper left lateral incisor was crowned to look like upper left central incisor and the upper left canine was Veneered to look more like an upper left lateral.Thus giving a more balanced smile. Patient concerned about appearance of front teeth, and black line over crown at upper left central incisor. Veneer upper right centre & lateral incisor and New crown at upper left central made. Upper left made with porcelain crowns. Veneers done on two central front teeth to align and repair heavily filled upper right tooth. Upper right central tooth heavily filled, upper left stained. Veneers were applied on the two central incisors. Cleaning stains from lower front teeth and spot grinding to straighten teeth. Patient had chipped front teeth, Veneers were fitted. Patient was very concerned about gap between front teeth. Veneers were fitted to reduce gap. If the gap was closed completely the teeth could be too big. Extraction of a milk tooth root, upper right and 3 unit bridge upper right fitted. Veneers upper central and lateral incisors fitted. Gap between front teeth reduced. Complex staining of teeth with missing lateral incisor, teeth were cleaning and a bridge was implanted to fill the gap to help improve their smile. Replacement crowns for central and upper left lateral teeth. New Veneers for the upper right canine and lateral incisor. 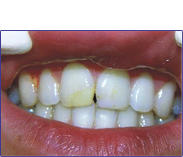 Discoloured central incisors. Upper left lateral incisor was Veneered to improve appearance.